If you want to spend a wonderful golf escapade this autumn season, choose Thousand Hills Golf Resort, home of the popular golf course in Branson, where many renown golfers have already played. The resort is conveniently located near the famous 76 Country Music Boulevard in the heart of Branson. Thousand Hills Golf Resort is popularly known to many famous golfers to feature one of Branson’s most fascinating golf courses. The award-winning 18-hole golf course at Thousand Hills is played by thousands of golfers each season. The golf course is equipped with challenging tees and fairways. The popular 18-hole golf course at Thousand Hills was rated 4-Stars in 2009 by the Gold Digest magazine and was voted Best of the Ozarks by the readers of the Springfield News. Thousand Hills Golf Resort gained its popularity because of its ability to cater different golf skill levels. From neophyte to professional golfers, the three separate sets of tees will assure you that the golf course remains challenging and fair for all golfers with no discrimination on age and experience. Playing golf in Branson during autumn season is a great time to spend a wonderful vacation escapade at Thousand Hills Golf Resort because you can feel the cooler atmosphere around the golf course plus the spectacular view of the beautiful foliage of vibrant green colors that change to luscious red and orange colors. As you spend autumn golf escapade in Branson, you’re sure to enjoy a home feel atmosphere when you stay at some of the comfy log cabin accommodations at Thousand Hills Golf Resort. Playing golf during autumn is as fun as staying in a cozy and comfortable accommodation of Thousand Hills Golf Resort. By booking an autumn golf vacation at Thousand Hills, you’re assured of ease and comfort in planning your travel to your first day at the golf resort. Once you take foot in the popular 18-hole golf course at Thousand Hills, you will discover a new world of award-winning golf courses that are connected with great names like Nicklaus, Fazio, Palmer, and even Payne Stewart. 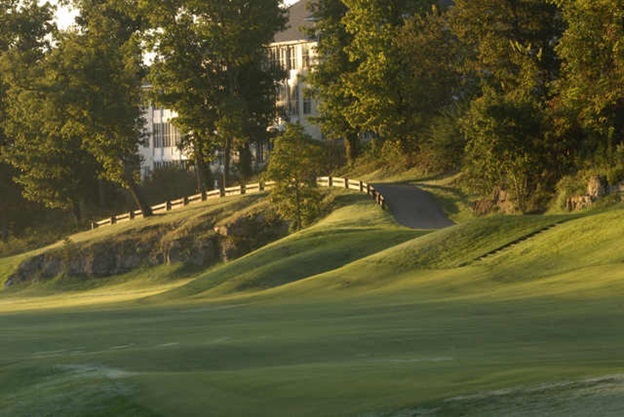 The beautiful setting of the golf course that features panoramic background of the rolling hills of the Ozarks offers golfers unique playing experiences that suit every level of golf player. The beautiful location of this 18-hole golf masterpiece allows you to see beautiful wooded forests, unique rock formations, and over Ozarks streams. In this part of Branson, you would never think that you are near the 76 Strip and Branson’s world-famous live entertainment shows. After spending so much time playing golf at the resort, it’ll be easy for you to try another outdoor adventure as the place is within 10 minutes drive from Table Rock Lake and 5 minutes from Lake Taneycomo. With the beautiful location of the golf course, you will surely enjoy the combination of spectacular foliage and challenging holes. Spending an autumn golf escapade at the Thousand Hills Golf Resort in Branson is a great way to get away from your busy city life.